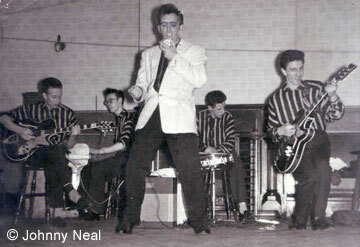 If you lived in Birmingham during the late fifties you knew the name of Johnny Neal. 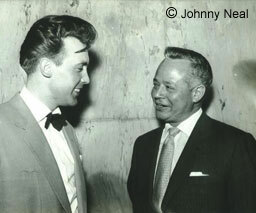 If you were a musician and aspired to be in a group you respected Johnny Neal and The Starliners. He brought Rock 'n' Roll to the city and was a face that appeared on television when TV was still in its infancy and to actually get on "the box" was no mean achievement. 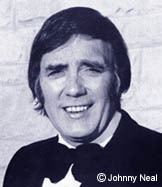 Johnny Neal: "My time in show business began in 1951 at the age of 16 when I discovered I could sing (a bit). Our idols, amongst others, were U.S. crooners like Nat King Cole, Frank Sinatra, Johnnie Ray and Billy Daniels, the latter who I copied to perfection and was billed as "Birmingham's Billy Daniels" at my engagements. This great American artist even granted me a photo shoot with him at the Old Queens Hotel, New Street Station and the article was featured in local newspapers and can still be see in "Brum in the Fifties" books. 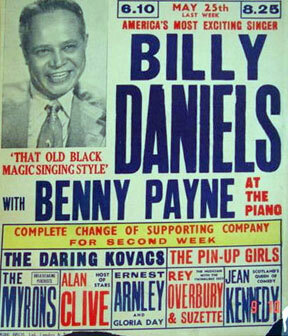 To really make my day/year, he also invited me as his guest to the Birmingham Hippodrome that evening. He asked for the lights to go up and introduced me to the packed audience who responded with a wonderful ovation for me. As you can imagine, this was a mind-blowing experience and the catalyst to my 50 year career. Unlike today, in the 50's you were a rarity if you sang or played an instrument, so I had the field to myself and practically won nearly all the talent contests that I entered and as black and white TV was in its infancy, I had my fair share of appearances on that medium also, so I was gradually building my reputation. At the time, we all met up at the "local hops", usually school halls where we danced the night away to local dance bands and "jived" which was new from the States. The the jive favoured in Brum was strangely enough 'The London Bop' and I did my Billy Daniels routine to great acclaim, especially from the female section of the audience, which I took full advantage of - nudge, nudge! I thought I could outdo anyone in the singing stakes, until one night at a local school hop, a slightly older slim-built, early Sinatra-looking guy, took the microphone and I witnessed and heard the pure magic of the best (in my opinion) local singer I had ever encountered before or since, which elated me and depressed me at the same time. I realized I was a raw novice to this naturally-gifted Frank Sinatra clone in phrasing, tonal quality etcâ you name it, he had it. His name was Kenny Day. He became my mentor, gave me advice, and told me to stop impersonating Billy Daniels and to get my own style. 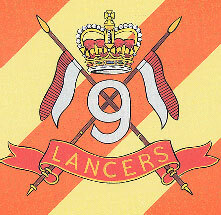 It was the days of enrolment for National Service and I was posted to the 9th Queen's Royal Lancers in Detmold, Germany. They had a tremendous regimental band, which at various social events split up into jazz, swing and dance-band units so I learnt my trade singing with all three. Mike Burney who played sax with me at one stage in civvy street (and later 'Wizzard'), was also a member of the 9th Lancers Band, but a little later than myself. I came home on leave and visited the Casino Dance Hall in Corporation Street and Kenny Day was playing double bass and vocalizing for the resident trio. I was asked to sing which I did and afterwards Kenny took me aside and to my astonishment told me that he couldn't believe how I had improved since he last heard me and if I continued in the same vein, I had a wonderful career ahead of me. I was floating on air for days after these remarks, and in truth, he is the only local vocalist to whom I would bow my knee. No praise is too high for the man who inspired me so much - pure magic! 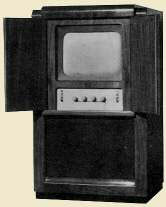 Kenny later went on to front his own weekly TV spot, 'The Kenny Day Show'. I was de-mobbed in 1955 and began where I left off, singing at local hops and entering talent contests. One such contest was the "Carroll Levis Talent Show" at the Birmingham Hippodrome. The 'Mike Jacks Trio' consisting of Mike Jacks (piano), Brian Sharp (drums) and Ron Hughes (double bass), were also appearing and I asked permission to use them as my backing band. We gelled, stormed the place, and were invited to appear on the Carroll Levis TV Show, which we did. 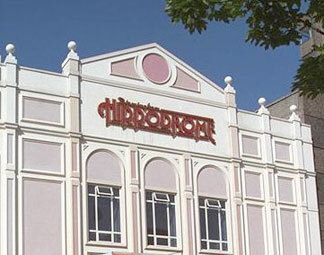 At some stage I was invited to the Hippodrome, to see 'Tommy Steele and The Steelmen', where I witnessed what I can only describe as a musical enlightenment of sound/excitement and movement, far removed from the staid, strict-tempo set-up that we were all accustomed to (so I knew I was on the right track). In short, they were a young person's music giving birth. Having said that, I did notice that the "Steelmen" were older guys, so I deduced that they must be session men, put together to back Tommy who was the same age as myself. In fact all of my guys were around 21 as by now, I had added Alan Jaeger (sax) and an old school chum Eddie Pepall (rhythm guitar), and the Mike Jacks Trio eventually became 'Johnny Neal and The Houn'dogs' (The TV Group as advertised on our business cards - that was our claim to fame at the time!) The biggest problem we had was the lack of rock 'n' roll tunes, so we adapted swing and jazz standards to fill out our repertoire, to complement 'Shake Rattle And Roll', 'Rock Around The Clock', 'Rock With The Caveman and 'Elevator Rock'. Brian Sharp got us our first booking at the Dog and Partridge pub in Yardley Wood. For the first time, we experienced mass hysteria for this "new music" which in reality was older jazz, rhythm and blues type music, dressed up with a different beat and with lots of sax and guitar riffs accentuating the excitement, but boy, it worked! Skiffle groups were starting to spring up all over, mostly 13 to 16 year old school boys, who were keen to get a start at the lowest musical level and gradually practice their skills until they dropped from exhaustion - such was the frenzy to join in the New Musical Revolution. Some of these guys today are international stars and I remember most of them starting up. One of my earliest memories were of 'Tony's Skiffle Group' featuring Micky Bakewell. They were extremely popular. Micky later went on to front The Modernaires, who were without doubt Birmingham's most successful resident band and were responsible for every group in the city buying an echo chamber! including The Starliners, who were later to become my backing band. An extremely well-researched factual account of the period can be read in the book 'Brum Rocked!' by Laurie Hornsby. The book pretty well encapsulates the mood perfectly, so I won't elaborate except to say that out of all the photos in the book, the one that stood out for me was the photo of Terry Wallace and John Badderick playing to the apprentices during their lunch break, which summed up the times perfectly - everyone in awe of a couple of guys playing guitar and wanting to be like them. Sheer excitement at the time! 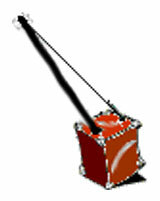 FOR SALE: Musical Instrument Kit - Broomstick, String, Tea Chest, 2/6 THE LOT. Electric bass guitars were still to happen and a speaker had yet to be formulated to accommodate them, so T-chest basses were the order of the day. I myself did not have that problem as Ronnie Hughes played double-bass and was very adept at his skill but the problem of amplification was common to everyone in those days and we also had difficulty with amplifying Mike Jacks' piano. Commercially available organs were yet to come, and The Starliners featuring Ian "Monk" Mutch on a Bird, two manual organ had the first on the local scene. I could go on and on but I will finish by giving an abbreviated account of how I remember and observed events at the timeâ Everyone in a skiffle group was playing rhythm guitar, including my own guitarist Eddie Peppal in the "Houn'Dogs" and the first guitar solo that I heard played was by Pat Wayne's Delta's guitarist. Tommy Hawkes (Sid) of 'Tommy Hawkes and The Hatchets' was the first Rock-a-Billy band and Tommy was the most exciting guitarist around, although I do recall, when they were backing me at Middleton Towers Holiday Camp, I said to Tommy; "Give us a 12 bar solo" and he didn't know what I meant, which absolutely amazed me, as he could make his Black Rose guitar talk. He was a "natural" and didn't understand musical terminology. The 'Tiger Sharks' were also developing away from the skiffle sound and were very exciting and we worked with them several times at the Birmingham Town Hall. The first singer/group I heard singing a rock 'n roll song apart from myself were "Frankie and The High Cards" 'Blue Suede Shoes' at the Moseley Road Institute. 'The Gators' were the first local band that I heard playing Texas honky-tonk music and when Brian Sharp left the Houn'dogsâ he joined The Gators' who were very popular and possessed in Jimmy Wilde, one of the finest exponents of the steel guitar that I have ever heard. I sang a few songs with them at the Bilberry Tea Rooms at the Lickey Hills, so I know first hand how good Jimmy was, especially for the times. The first pop group in Brum, who crossed the divide from everything else at the time, were 'Pat Wayne and The Deltas', who with their good looking vocalist and his well dressed and rehearsed Deltas, set the standard for others to follow. Pat and I were the first local groups to appear on TV in 1957 with our respective backing bands Deltas/Houn'dogs 'Roll Back the Carpet Show'. Over the next few years groups and bands were everywhere. 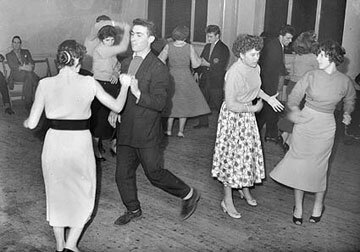 In every pub or dance hall, one or two groups would be performing each night. There was no problem in buying equipment. It was coming in, in droves from the U.S.A. and also British solid body guitars were making their appearance. Burns and Watkins guitars were very popular competition to the German built Hofners and Framus' and retailed at an affordable price for the "beginner" market. The Shadows were the top instrumental group in the country. Bands like The Grasshoppers, The Crestas, The Renegades, The Sinners, and The Solitaires went on to record the first BRUMBEAT LP in 1964. I have many more tales to relate and maybe I will at a later date. I still have my equipment in the UK and also here in South Africa (I have been solo for years), so if the call should come (and I fancy it), who knows? Finally, I would like to acknowledge all the other guys and girls who have travelled the same road, especially another old mate Danny King who, with his unique talent, was with me from the beginning - its been a privilege to have known you all and I would like to dedicate this article to the memory of Ian "Monk" Mutch." c/o Bulls Head Bob. All text and images in this feature were provided by Johnny Neal.